Unifor President Jerry Dias has said the union will spend millions to save the GM Oshawa, Ont., plant. Unifor will bring its campaign to keep General Motors Oshawa, Ont., assembly plant open to the attention of millions of Canadians when it runs a television ad during Sunday’s Super Bowl broadcast. The closure would throw about 2,600 members out of work at the end of the year. The ad will run in English and French during the simulcast of the game, broadcast on CTV, CTV2 and TSN. The ad will not air in the United States. The spot reminds Canadians they loaned billions of dollars to bail GM out of its 2009 bankruptcy. Unifor’s ad has the chance to reach millions of viewers. Bell Media said last year it drew an average audience of 4.451 million viewers for the 2018 Super Bowl. 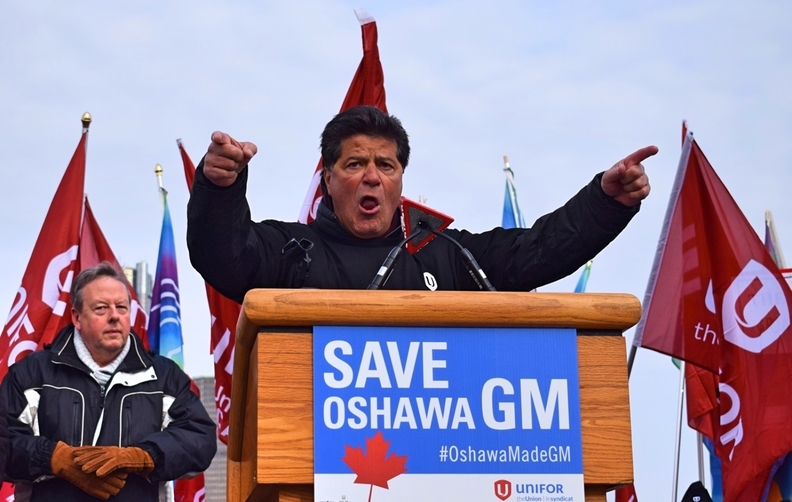 “We will do everything we can to show people how to tell GM they will not purchase vehicles made in Mexico from a company that is putting thousands of Canadians out of work,” Unifor President Jerry Dias said in a statement. Unifor didn’t say how much it paid for the ad, however Dias has said the union is prepared to spend millions on its effort to reverse GM’s decision. General Motors in November said it would no longer allot product to the factory beyond 2019. The automaker is halting production of the Chevrolet Impala and Cadillac XTS and it will also end the shuttle program, which sees unfinished outgoing models of the GMC Sierra and Chevy Silverado shipped to Oshawa from Indiana to be completed. A second commercial, which urges consumers to take an online pledge not to buy GM vehicles made in Mexico will also debut this weekend. The ad demonstrates how consumers can easily identify where a vehicle is made through the Vehicle Identification Number (VIN). If it starts with three it is made in Mexico. “We import just three models from Mexico out of 47 we sell in Canada. The ’VIN 3’ campaign just hurts Unifor’s members at GM Canada’s plants and over 60 Canadian suppliers who make parts here for Mexico in NAFTA,” GM says. The two new Unifor ads will then run on high-visibility Canadian broadcasts of the Academy Awards, the Grammy Awards and during commercial breaks on NHL hockey games.